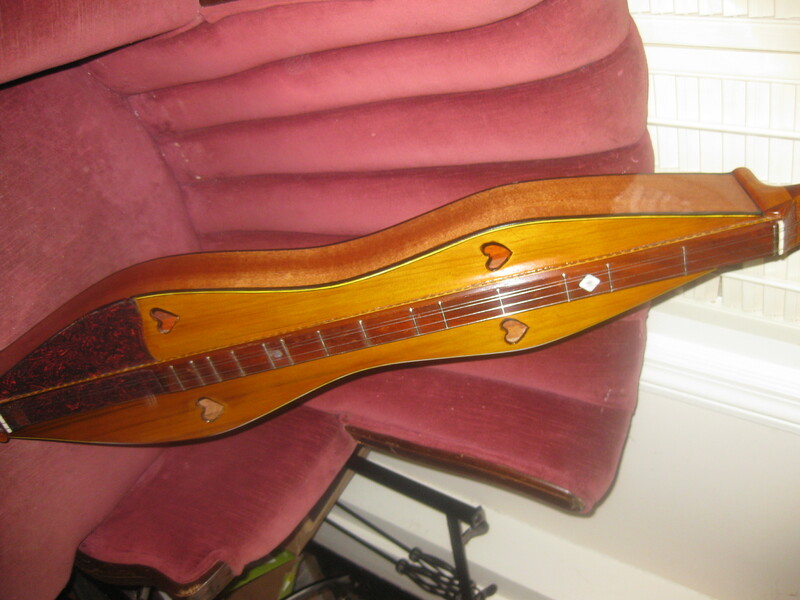 This project is something a little different for me, but it was kind of inevitable; the final impetus for making this dulcimer felt like a directive from unseen forces. Richard Farina was an early and profound influence on me in those formative teenage years when finding something or someone that affirms and enhances your own still developing but unique set of political, spiritual, aesthetic beliefs can be almost overwhelming. When my brother Bo came back from a stint in Texas in the USN, he brought with him a Mimi and Richard Farina record, and I was hooked at first listen. Farina played the dulcimer, but played in a rhythmic and almost feverish style, playing melodies that sound to my ear now like an early recognition of the wave of World music that would come 30 years later. His lyrics were intelligent and poetic, even in that era of intelligent and poetic lyrics. I read his hilarious novel, Been Down So Long It Looks Like Up To Me, several times in high school, and its style and wit led me to an appreciation of Thomas Pynchon, my favorite writer. Pynchon, reclusive enough to make J.D. Salinger look like Paris Hilton, happened to be the best man at Richard and Mimi’s wedding. Farina himself died in a motorcycle crash two days after his novel was published, at the age of 29. The perfect model for teenage ennui. Of Cuban and Irish heritage, his meditation on the stigma of “mixed” marriage prevalent at the time, The Quiet Joys of Brotherhood, stands as a model for me of lyrics being made more profound by their simplicity. This version was recorded by Mimi after Richard’s death, with a string arrangement by Peter Schickele, (aka P.D.Q.Bach), that mirrors the deceptive simplicity of the lyrics. When love was lord of all. 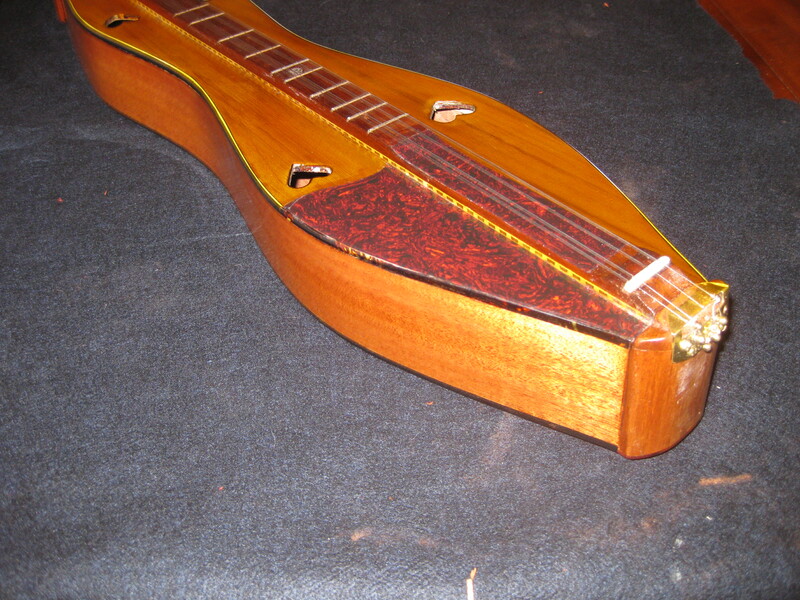 So Richard Farina was the reason behind my buying that dulcimer kit in 1968, that sparked the flood of dulcimers built by my Dad, and written about elsewhere here. 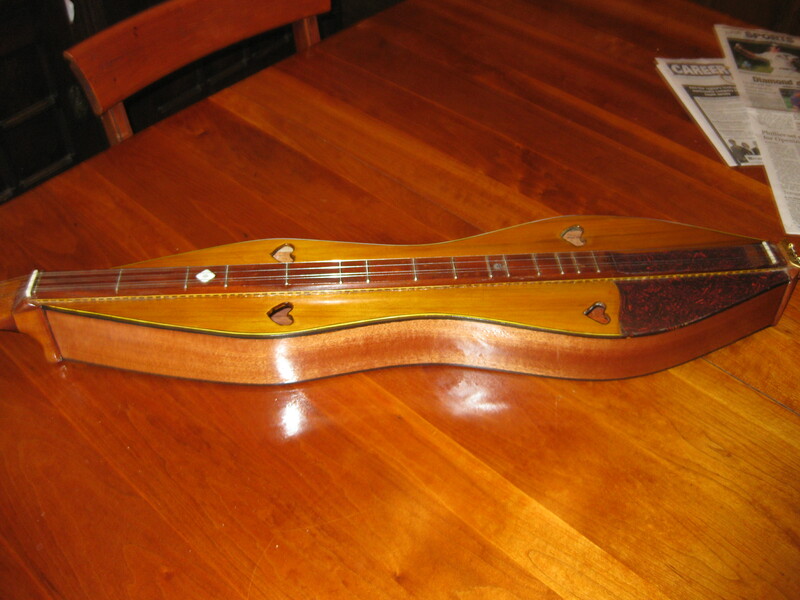 Lately, it had occurred to me to try to build a copy of Farina’s dulcimer, based on a few pictures I had seen on album covers, etc. A couple of years ago I’d read an article about the Australian luthier who built it for him which intrigued me, but didn’t offer as much detail as I’d hoped. 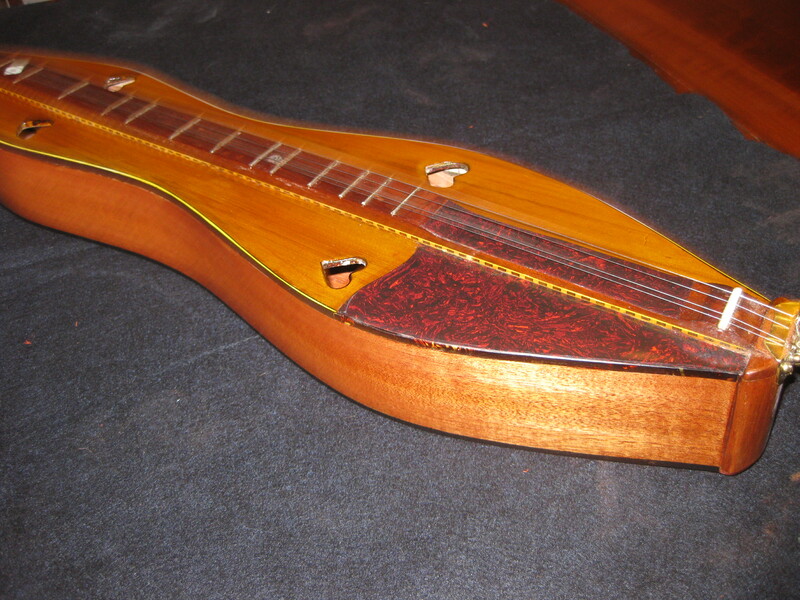 On a visit to Georgia recently I was talking to Bo, who raised the notion of building a dulcimer with construction and detail like you’d find in a guitar, and I mentioned the Farina project I had in mind. As with so many conversations these days, this one was aided by a nearby laptop, and a web search turned up the same old set of pictures, the same article about the luthier, but the only thing new of note was the story about Mimi donating the instrument to the Smithsonian, which had no plans to exhibit it in the near future. So I followed the basic ideas of the original as far as shape and dimensions as near as I could determine, but added some flourishes of my own. Interestingly, the scroll was almost exactly like the one I did on my latest cello . A purpleheart and padauk back with a marquetry center strip, banjo tuners instead of ukelele ones, an actual tailpiece instead of screws to wrap the strings around, and more elaborate bindings.I used a zero fret like the original, and I copied the pickguard detail, an absolute necessity to playing in Farina style, and got a little fancy with some tortoise binding that makes it look like an inlaid slab. 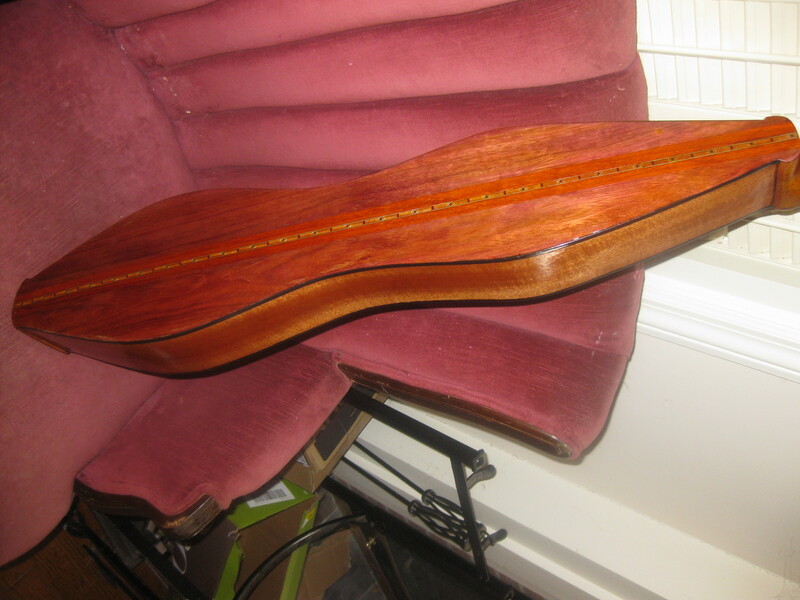 Rather than the non-continuous fretboard on the original, the fretboard on mine is hollow the whole length, sitting on two rails, and bound with some additional marquetry. Yesterday I strung it up, the moment of exquisite suspense for a luthier. The sound was big and rich, and the box is still humming for a while after you set it down. My mission having been completed, I can get back to mandos now. My name is Nev. It’s short for Nevin, that rhymes with Kevin, and not with “leave.” There is a show on MTV now called “Catfish” that stars a fellow named “Nev” whose name is short for something else, and it does rhyme with “leave,” so I wish he’d spell it some other way that made phonetic sense. I have a thing for unusual names, I guess because I’ve been given one. It was my grandfather’s name, and one that is not all that uncommon in York and Lancaster counties in PA, and what was told to me is that he was named after an English doctor named Dr. Nevin. I’d assumed the doctor had something to do with obstetrics, but through the miracle of the information age, I recently found out about a Dr. Nevin (English, and not just English speaking, as the Pa. Dutch refer to anyone who speaks English as “English”) who ironically was a guest lecturer in many German speaking churches in those counties, promoting the use of English in church services rather than German, in order to promote assimilation. My great grandparents must have fully embraced that notion, as my granddad only spoke enough to curse at his kids, and my Dad only picked up enough to mimic him on rare occasions, and when pressed, admitted that he had no idea what curses he was actually throwing our way. I didn’t always love my name. When I was young I often thought it was a burden to have a name unfamiliar to most other kids, like it imparted a sense of difference that, while traumatic at an early age, comes to be more desirable as one ages. We get to name our kids, and I get to name my instruments, but what would you name yourself, given the opportunity? I fluctuate somewhere between “Bull Tanner” and “Mahatma Ferlighetti,” so I guess I’m better off with what I have. I have an old friend, whom I haven’t seen in years, who, as part of the process of pushing a reset button on her life, had her name legally changed to “Jerusalem Walker.” It’s such a great name that it makes me think we should all make up names for ourselves, but I doubt that many would think of one any better than that. I asked Jerusalem if she minded my mentioning her and her name on these pages, and also, which version of “Walk in Jerusalem ” had inspiured her choice. She didn’t know the song, so either it’s a coincidence on par with my Emma Nevada story elsewhere here, or there is some other reference that I’m unaware of. In any case, it’s an amazing name, chosen by an amazing person, so I get to choose the version, I guess. The name for this mandola, the first of its kind, is “Lola”, which beyond the poetic imperative, is the name of my mongrel dog. Part poodle, part spaniel, part dingo, (who knows? ), she has matured into a faithful companion and an enthusiastic circus-dog wannabe. 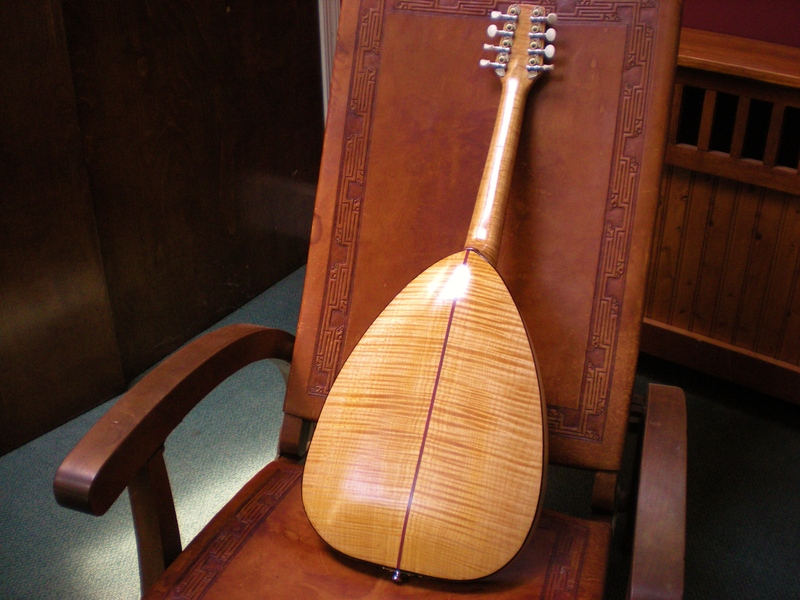 The top of this mandola, though vaguely A-style shaped, is canted rather than carved, because of the great results I’ve been getting from this age-old style of making tops. I like the way the headstock looks, and is in keeping with my tendency lately to reduce the lateral angle of the strings as they hit the nut, as in the snakehead models of Gibson, but even more so here. 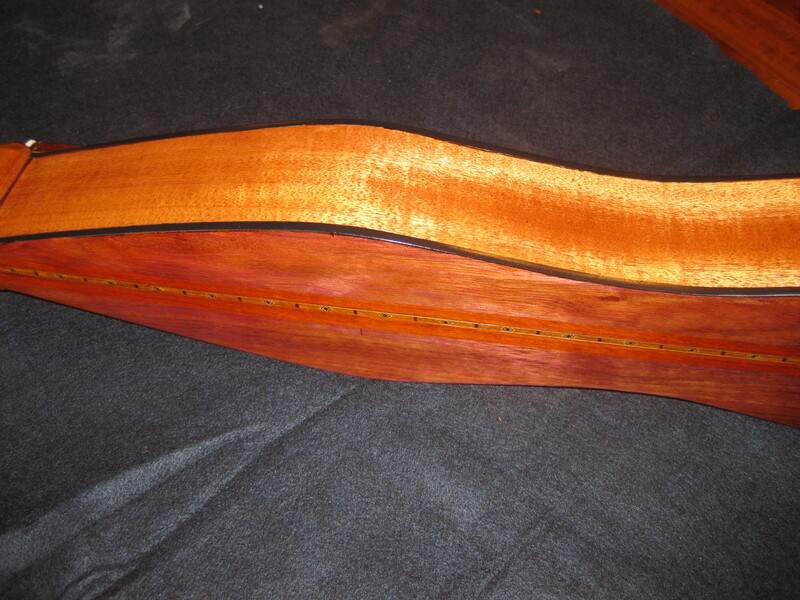 The back is maple and padauk, in reversed order of prominence to the Gypsy and Bohemian models, sides are mahogany and the neck is flamed maple as well. This is only the second mandola I’ve made, and the better of the two, but it’s interesting that the inspiration for building instruments in the first place was the mandola playing of Ry Cooder on his early solo albums, and my determination to build what was then a fairly rare beast. He’s playing a mandolin here, and just as he does things with a guitar and a steel slide that no one else can do, his style of mandolin playing is uniquely his. Just like his name. When it comes to “tradition,” I’m firmly on the fence. I champion innovation, and try to practice it in my work. The cost of innovation is easy to see, in the small collection of instruments that I’ve made that are consigned to a shameful life on the wall of my shop, reminders of the fragile balance in this enterprise between innovation, and what dependably works. I’ve had a breakthrough or two, as well, that I could never have discovered if I built instruments from blueprints all the time. But some old ideas are old because they are still the best. The same is true of objects, for me. As the offspring of antique collectors, I spent countless childhood hours in auction galleries, and the payoff was the occasional box lot of old junk, purchased for a quarter or so, to keep me amused and enthusiastic about being someplace that most children would find intolerable. As I handled each one, a cast iron toy, an old pair of spectacles, an ancient school primer, I imagined the opening of a special Christmas present, the sudden gift of sight, or the trepidation of a first day of school, the time when, for however briefly, these objects were the focus of someone’s life, and then tried to imagine the sad journey of increasing irrelevance that each thing had endured that led ultimately to its deposit in this box and thus into my hands, where its story could be told to an eager listener. 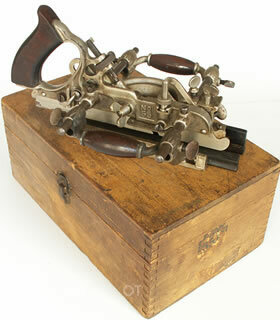 Later, in the course of doing historic restoration for 25 years, my fetish for old objects was legitimized, as it became necessary to acquire a collection of old woodworking tools, particularly molding planes, in order to duplicate the occasional short piece of molding, using the implements that had created the original. 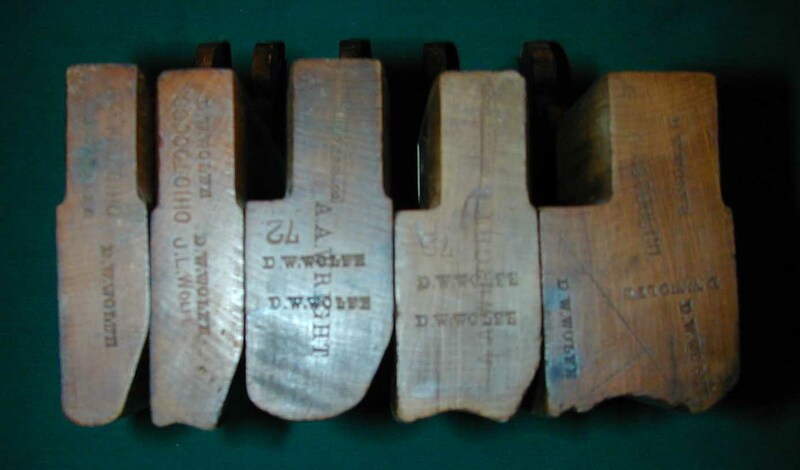 These planes cut a variety of profiles on the edge of a board, and before 1860 or so, door trim, baseboard ogees, window sash, etc were all formed with the planes that a carpenter had in his toolbox. The planes themselves were treated with great care, which is why you can still buy a great example, skillfully made by master plane-makers around 1800, in perfect working order for about 20 bucks. 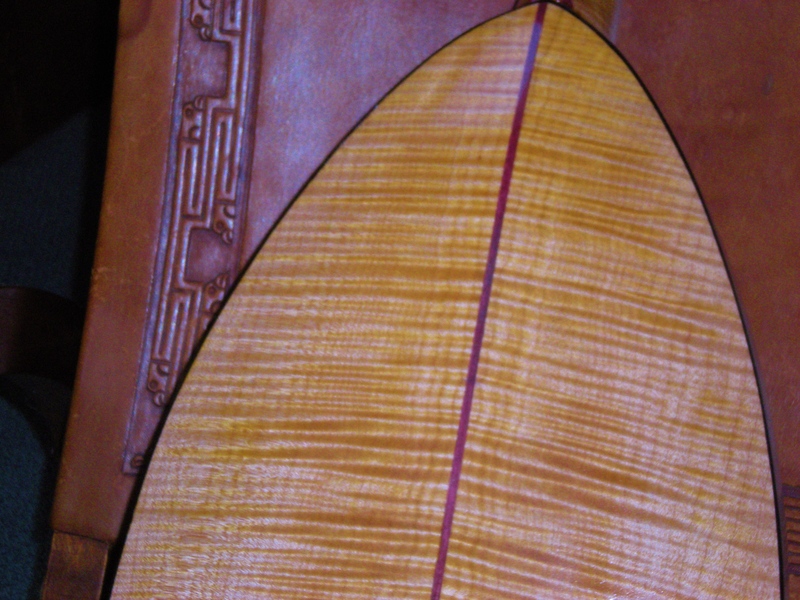 Besides the maker’s stamp, usually there is at least one owner’s mark as well, and when you pick one up and start cutting a bead on the edge of a board, it feels like the previous owners are watching you. They have the best patina there is, too, one that can only be achieved by 100 years of rubbing hand sweat into the wood, and if you doubt me on that, check out any mahogany handrail in any 150 year old house, and tell me if you’ve seen or felt anything as sublime. Many people think of the Victorian era, with the gingerbread porch trim, the wide hardwood moldings, the multi panelled doors, as the peak of American craftsmanship. But I like to point out that it was a modernist movement, a celebration of the machine age and of mass production. All those architectural elements came factory assembled, even the door trim, with its bulls-eye plinths, were created to speed the carpenter’s work by eliminating mitered joints. It would take a man a day to make 20 feet of 4 inch wide hardwood molding with all the contours of Victorian era trim. 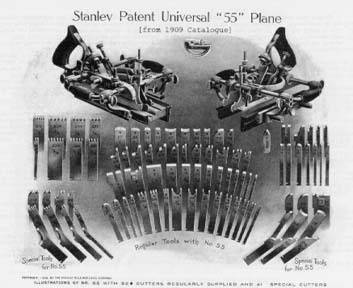 So right about the time that the Stanley company came out with the #55 plane, an endlessly adjustable monster with over 50 blade profiles that was promoted as being capable of duplicating any molding profile, it was obsolete. They continued to sell for many years because they are extraordinary objects. Yes, of course I own one. But if I have to run a bit of vintage molding, I’ll reach for the good old wooden ones. The #55 only gets taken out of its box when I want to marvel at the intricacy of its engineering, which is only more amazing because of the various gorgeous rosewood hand grips and the floral engraving on the nickle plated body. Such flourishes would never be considered by a tool maker in the 21st century. But then, no 21st century maker expects that the buyer will leave a tool to his son eventually, and he to his. That was the assumption with this plane, and it perfectly reflects the cultural values of its time. But values change, and people tire of any fashion that reminds them of the old values, and after a while, Victorian “gingerbread” was torn off porches, miles of natural wood trim was painted white, and the intricate architectural details that once seemed so fanciful , (and lately have once again, albeit now molded from PVC), began to feel ordinary and out-dated. Too traditional, if you will, proving once again that nothing is quite as “traditional” as the abandonment of tradition. Several movements took hold to provide relief, most notably the Arts and Crafts movement, that reintroduced the aesthetic of honest workmanship by craftsmen to replace the tyranny of mass production. 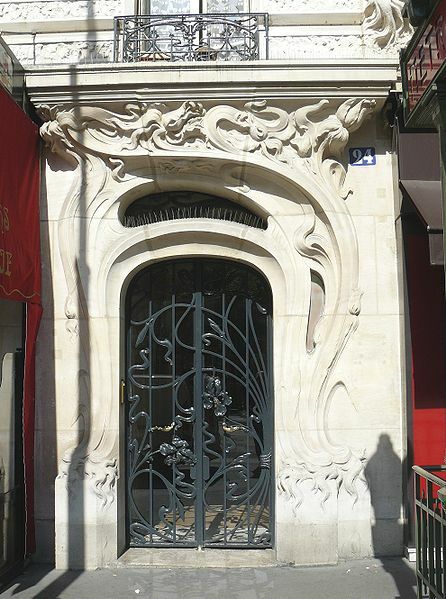 The Art Nouveau movement also , I think was a response to the rigidity of the excesses of geometry imposed by Victoriana, featuring flowing lines that seemed to capture forever the mood and whimsey of their creators at a particular moment in time. 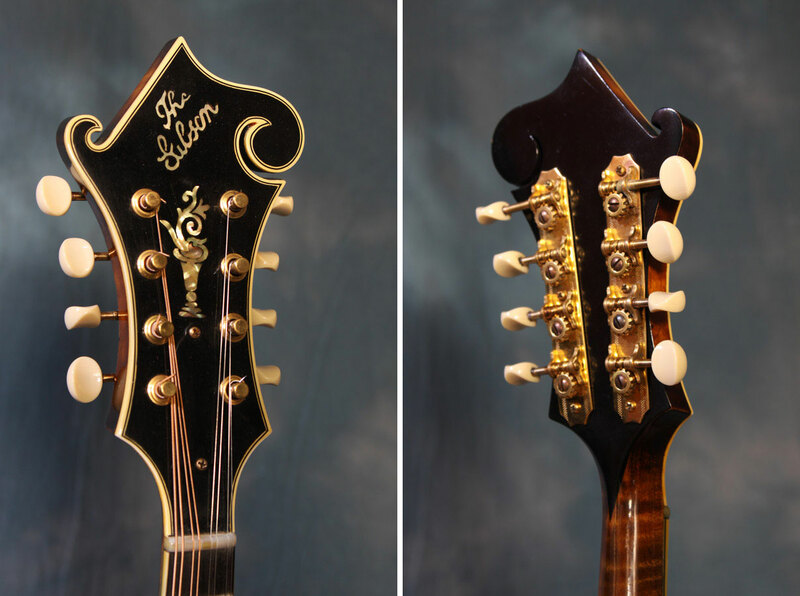 I’d make the case that the Art Nouveau movement heavily influenced Orville Gibson when he designed the F style mandolin, and the headstock in particular, with its flowing,asymmetrical, and almost whimsical lines, even the vase inlay reflects a common Art Nouveau motif. His lyre-shaped one-off that became the graphic symbol of the company also falls firmly in the style. It was probably a tough sell to the production folks at Gibson, but the point was likely made that if a beautiful sounding instrument could be identified from the 20th row by its distinctive headstock, it would be good for the brand, and worth the extra 20 minutes in production, the occasional snapped off piece, and the retooling of the tuners to fit the new shape. There’s no disputing that the point was well made. And there’s no disputing the beauty of the headstock that Gibson designed, and that Lloyd Loar embellished with intricate bindings. It perfectly embodies the time and place in which it was created. Its visual appeal has endured. Perhaps too well. What torments my thoughts in those moments when mandolin thoughts torment me, is why hundreds of obviously skilled luthiers in this country would endeavor to duplicate that headstock design on their own instruments. If it is an attempt at tribute, I doubt Mr Gibson or Mr.Loar would appreciate the effort. It has made their creation ordinary, no longer telling the observer the age and origin of the instrument from the 20th row, or even the third. It is forgery masquerading as tradition. The headstock no longer speaks of the ebullient spirit of a master at the peak of his craft in a post-war, pre-Depression America wanting to cap off his masterpiece of acoustic design with a touch of fancy. Certainly he would understand the endless copying of the acoustical box, a design that has proved its worthiness, and probably would take in stride the duplication of his body scroll design, the concept not being entirely original to him, although I suspect he might scratch his head at the compulsion to replicate every angle, curve and binding detail of his . But the headstock, well it strikes me as an impersonation as vile as check forgery. I mean no disrespect to those highly skilled makers who practice this, but I imagine the ghost of Orville Gibson standing over you at night, moaning about the headstock being a blank canvas, other than considerations of mass and balance, so why would you paint the goddamn Mona Lisa over and over and over again? My poor little Mama had had enough to adjust to, with being uprooted from her home turf in rural Georgia to start a new life and a new family in the Pennsylvania Dutch city of York, Pa. Now, with two young children and one on the way (that would be me), she had the anxiety of dealing with having a Gypsy encampment right on the other side of the fence at the back of their small yard. She’d seen the horse drawn wagons of Gypsy caravans pass by Baxley, Georgia when she was a child, had heard from her mother that, as a people, they endorsed thievery as a life strategy. So she spent anxious hours watching to assure they didn’t steal her kids’ toys from the backyard, or worse still, steal her kids. I heard this story several times when I was growing up, though recently when I asked her about it, at the age of 90, it doesn’t seem to be one of the stories that stuck with her. It makes me wonder which stories that I’ve told my kids about my life will be the defining ones for them in spite of their being relatively insignificant stories in my own narrative. But the gypsy stories intrigued me, partly because we as a people are always fascinated with gypsies, and because at those times when kids imagine running away from home, I had the alternative fantasy of wondering what my life might have been if those gypsies had kidnapped me (not that I think for a minute at this point in my life that those gypsies were looking for another mouth to feed). Being a well-stirred genetic product of 250 years in the melting pot of America is a point of pride for me, but there have been times when I felt envious of others’ ethnicity. I have longed. at times, for the sense of identity and belonging to an intractable and distinct subculture that ethnicity allows and sometimes mandates, and no ethnicity embodies that sense of belonging, and the accompanying sense of estrangement from the surrounding culture, more than Gypsies. Nobody knows exactly how long gypsies have roamed Europe, and later America, but we do know now that their origins are in India, not Egypt as was first assumed, the assumption from which they got their collective name, and it’s a sign of their separation from the larger culture that they never felt the need to correct that assumption. So there was a fantasy in mind as I worked on this mando. 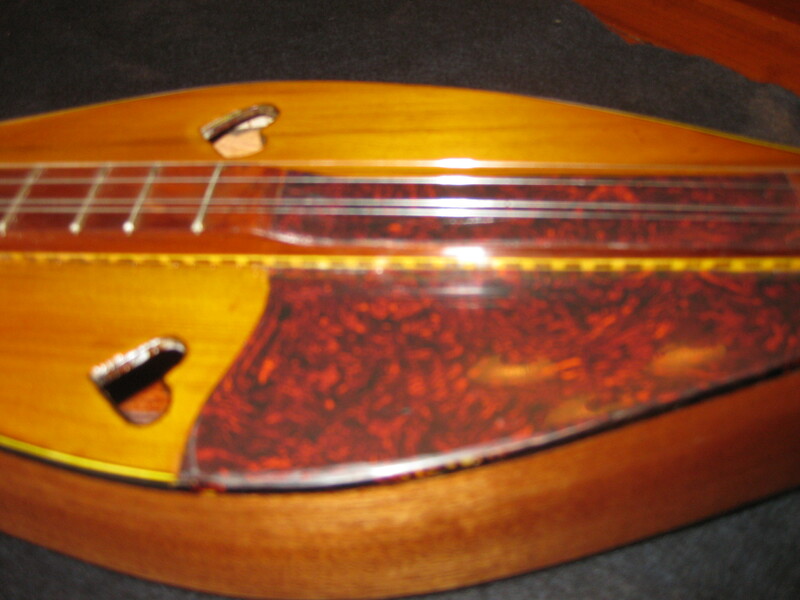 This is a mandolin sized version of the Bohemian mandocello that I made in the spring. 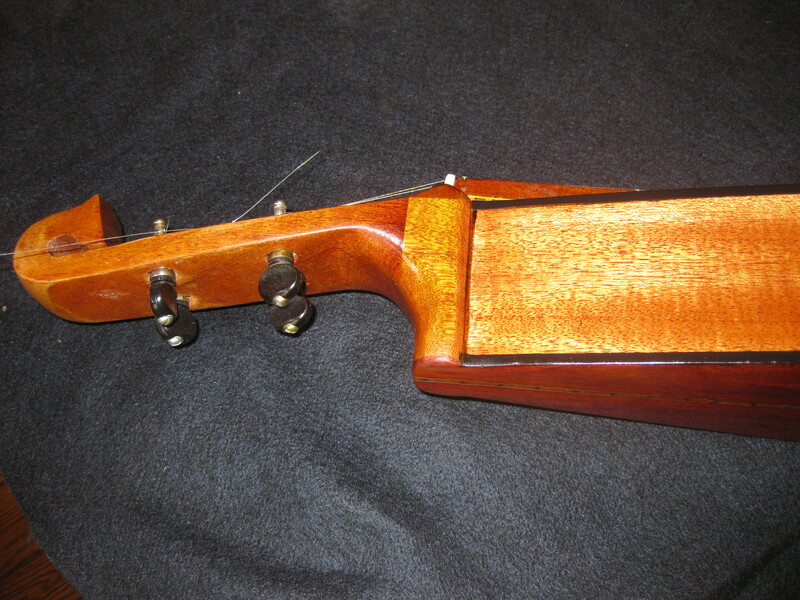 It has a similar back carved from padauk and maple, a one piece neck with violin type scroll of big leaf maple, a maple fretboad (13 7/8″ scale) bound with bloodwood/ebony/holly/ebony, with green abalone markers, canted top of Alaskan Sitka, tortoise celluloid bindings with wood purflings, mahogany sides, padauk headstock overlay (of course!). I called it Gypsy because it doesn’t strictly follow any tradition, but that all its elements are traditional ones conjured the thought that this could be a gypsy mandolin, unique and indifferent to popular culture, a mandolin that, on the night before a new migration, and the wagons were packed, Aunt Zora might bring out from its special place, tucked into a trunk full of colorful silk scarves, to play by the campfire while her daughters sang songs in whatever language that gypsies sing in, songs of their trials and triumphs. Or, it could be plugged into a stack of Marshalls, and played with the great Gypsy-Punk band, Gogol Bordello. It was St. Patty’s day, probably 1980 or so, and I’d found myself at Cavanaugh’s at 23rdand Chestnut in Philadelphia, considered by some as the only legitimate spot to celebrate this holiday where everyone pretends to be Irish and drinks so much that eventually they’re persuaded to drink beer with food coloring in it and experience barfing in technicolor at some point while trying to find their way home in one piece. So many people had had the same idea, and soon the bar was packed beyond capacity, and in spite of the excellent band playing traditional Irish music, my cohorts and I had decided to leave, on the basis that we were never going to be drunk enough to make the over packed conditions tolerable unless we were able to move our elbows, which was quickly becoming impossible. On my way to the exit, at a rate of about 1 ft/min. I found myself squeezed by the crowd into a full body press with an attractive young woman, which was awkward, though not entirely unpleasant. Since our position couldn’t be ignored or changed of free will, I said, “I think under the circumstances, I should introduce myself.” She didn’t miss a beat and said,” I’ll say. According to my Mom’s rules, I think we just got engaged.” I still laugh at that line. But I no longer try to drink with the Irish on St. Patty’s day. It’s fighting above my weight class. When I first started hearing the term Irish bouzouki , it was kind of jarring, like Norwegian sitar or French balalaika, or Belgian Conga (OK, forget the last). The traditional bouzouki from Greece was introduced into Irish music in the 1960’s by Johnny Moynihan of “Sweeney’s Men,” who later brought it to “De Dannen” one of my favorite groups, whose huge but acoustic sound can mesmerize me. 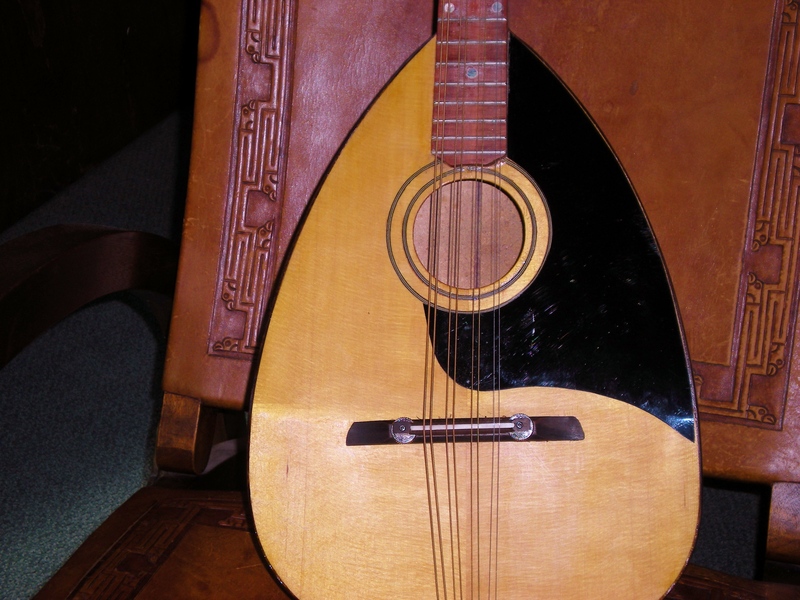 A big part of that big sound is likely the bouzouki, which is close in size and voice to the octave mandolin, but usually tuned to GG-DD-AA-DD as opposed to the octave mandolin tuned to GG-DD-AA-EE. 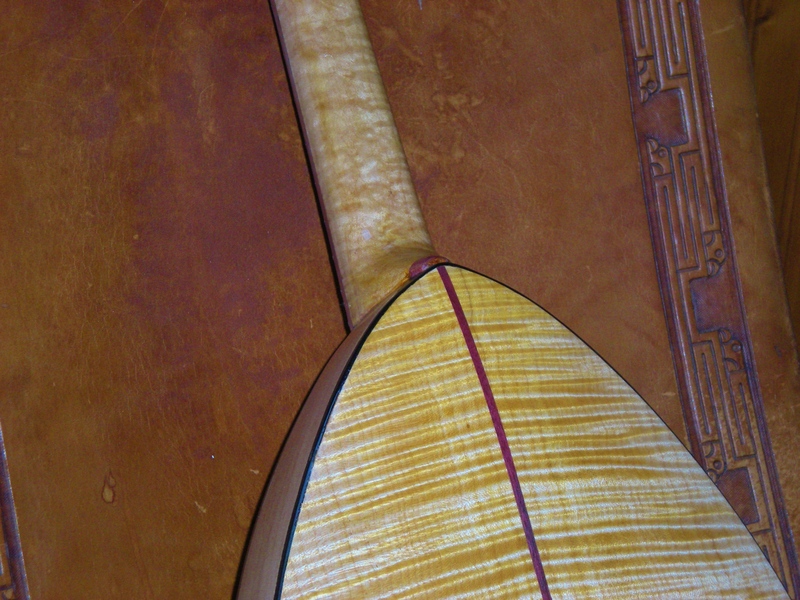 The scale length is usually longer on a bouzouki as well, but fact is, many now use the two interchangeably. 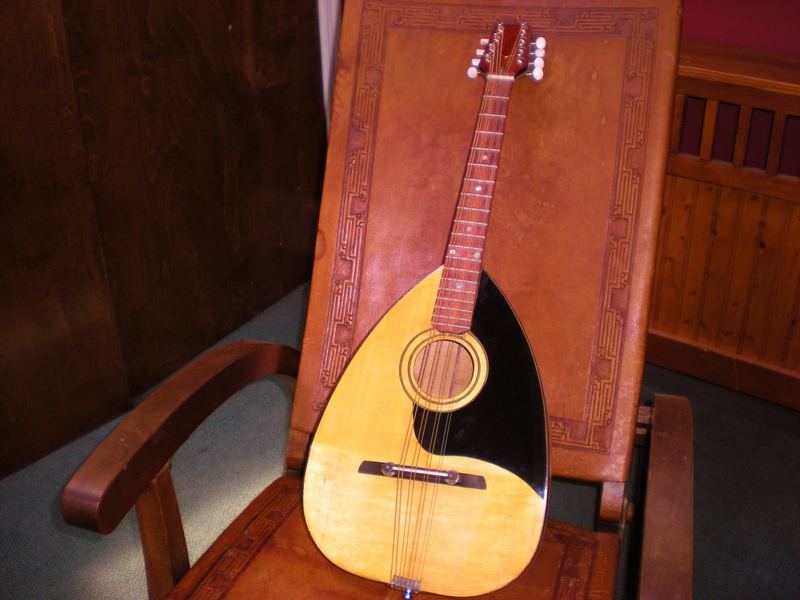 What I have here is an octave mandolin, with a 20” scale, structurally similar to the mandocello I recently built, with a folded flat top with minimal bracing on the part behind the bridge. It has a BIG sound. I didn’t do a scroll headstock on this one, or the “Bohemian” back, instead going with a more traditional carved maple two piece back with a purpleheart center strip. I’m working on another one with the scroll, etc., as well as a mandolin sized version of the Bohemian mandocello that has me very excited. But I really do love these OM’s. I think I’m going to have to start learning some De Daanen songs. Judy and I were not able to take a real honeymoon after we got married. Our attempt at a romantic road trip from Philly to Key West in my 1967 Plymouth station wagon came to an unromantic end on Christmas morning (we got married on dec. 23rd, and I’ll never do that again! ), when a bearing went out on the rear axle. We squeaked into the only service station near Darien, Georgia that locals told us might be open,. because the guy lived there in the garage office. He was there all right, but was no mechanic. His brother, who was, had capriciously taken Christmas day off, it seems. So we sat in the office with him, grease everywhere and coffee cans with two inches of water soaked cigarette butts in each, and waited for my brother and my dad to come get us (they lived a mere 40 miles away as luck would have it), Lum (short for Columbus, the town where he was born) told us he lived there alone with his brother and his five little nephews, and spun the chamber of his Smith and Wesson revolver with the five bullets as illustration, and we all laughed, But shortly afterward, Judy and I decided to wait outside for the remainder. A couple years later, when we were a little more flush, we decided to take a real vacation, and at the suggestion of a travel agent decided on Ixtapa, Mexico. It was being heavily promoted in those days, big fancy hotels on the Pacific beach, everything you could ask for. But we were both more interested in the local culture of nearby Zihuatenejo, a little fishing village that the astute movie fan might recognize as the destination of Andy and Red in The Shawshank Redemption. A local guide told us the story of the name. It was from an ancient, dead language of Oaxaca, and meant False City of Women. It seems that some adventurers from the other side of the mountain range that separates the coast from the interior had returned to their village from the coast with stories of a city on the water that was populated only by women. Predictably, this led to a larger expedition of enthusiastic and lonely men across the mountains, who found when they arrived that there was only this fishing village, normal in that it was about half men and half women. Hence, the name. We can only guess the motive of the false correspondents; maybe all the men were out fishing when they had arrived,. Or maybe they just meant to say that there were a LOT of women there,. Maybe they just wanted to exploit the absence of the men in their own village by cavorting with the women at home while the rest went to the coast in search of greener pastures. There’s a lesson in here somewhere about the benefits of healthy scepticism. There are a LOT of stringed instruments being sold today that are made in China, but which have stalwart, traditional sounding American names that suggest history and integrity, names like Eastman, Kentucky, The Loar (for crissakes). I’m not going to disparage them, or their customers, because quite frankly, it’s hard for me to compete with the prices that production in a Chinese factory makes possible, although my mandocello prices compare with Eastman’s. Mine aren’t done when the foreman says they’re done, they’re done after I’ve played them for a month or so and am satisfied that I won’t regret sending one out into the world with my name on it. No two of mine will ever be identical, which rules out mass production. But the karma is included free of charge. Many people, some of whom I respect a great deal, tell me that Chinese instruments are every bit as good as any other. To which I tend to question why it is that musical instruments would be the only product from China of which this is true. Every tool orr utensil or article of clothing I’ve bought that was made there failed on the first or second use. It’s like they make visual representations of real objects, functionality be damned. Other enthusiasts will state with great certainty that these instruments are carefully made in craft shops by seasoned Chinese luthiers who are well compensated for their careful work, and tell tales of American visitors who have seen this to be true. To which I tend to reply, Zihuatenejo, Baby.